This profile can also be used to craft large picture frames. Table edge router bits from Pro-Tech can be used to form deep decorative detail found on dining room, coffee or end tables, window sills, chair rails and china cabinets. You can create a unique style edge or duplicate a classic design. One edge, or top and bottom edges can be moulded depending on wood thickness. Grandfather clock gooseneck mouldings are one favourite projects this router bit is called for. With large diameter router bits best results are obtained by making several light passes, increasing depth of cut with each pass. In order to minimize burning on some woods such as cherry, maple or oak, the Router Speed Control can be used to reduce the router speed. 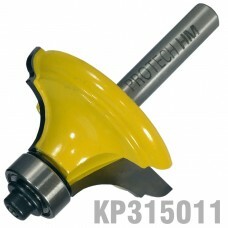 This router bit has a 6.35 mm shank (shaft) that will fit most small or large routers with the correct size collet. Please ensure that you select a router bit with a shank (shaft) size that will fit into your router collet.